Yes, this is a Commander-targeted card, but hear me out. One of the biggest challenges with building a direct-damage-based competitive Vintage deck is the lack of viable card advantage engines. Against control decks you'll burn through your hand, only to have the opponent stabilize and run away with the game. 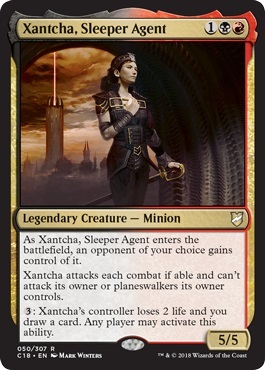 Xantcha plays double duty: it lets you funnel surplus mana into refilling your hand, and also, once it's in play, gives you a repeating source of direct damage. Yes, your opponent can also activate Xantcha's ability, but how many cards are they going to draw when they're at 10 life and you're threatening to burn them out? Bloodchief Ascension has been on my "unbroken" list for years: cards whose effects read as extremely potent, but never made a splash in Vintage. Ascension unfortunately suffers from the rampant Missteps in the format, but once online it is an extreme threat: it's a Kembal that also punishes cracking fetchlands, getting Wastelanded, dredging, discarding to hand size, etc etc. If we assume that you're not trying to attack to win you get to compare it to something like Phyrexian Arena or Painful Truths maybe? It seems like this would be too slow almost all of the time, but there are some decks that play a slow game. I could imagine this in a niche role in control mirrors out of a Grixis deck? What I imagine for this card is a grindy Grixis list with Mana Drains, lots of mana and removal, dropping it sometime in the midgame and just activating it EOT on any turn you have mana up. It drags things out a little while get up to 6 mana and then tighten the vise entirely. I don't know for sure how many decks could justify the space, but I can certainly recall board states where this card would be very good. And once Bloodchief Ascension has quest counters, Xantcha doesn't do anything special with it, so you're really just talking about dealing 6 damage for 12 mana. If you want to activate Bloodchief Acensions, I don't think Xantcha is the card to help you do it. @brass-man I've never been much of a fan of Grim Lavamancer, as I've found him too unreliable to activate. Deathrite Shaman is obviously fantastic and belongs in any deck with Ascension. What I've found in the past is that Ascension can be difficult to trigger in the mid-game, especially during opponent's turns, which is critical to getting the enchantment online in a timely manner. DRS helps with this and so does Xantcha. Not a fan. At 3 to cast and 3 to activate, it's likely you'll end up taking 10 damage to deal 4 and draw 2. It would have to be played in a creature heavy deck to not risk becoming a threat by itself. I think I like the original Sleeper Agent better than this. The other guy at least will give you 2 damage for 1 mana pretty guaranteed. @wagner it can't attack it's owner. Clearly you need this with Brand (for the final swing). This may fit awkwardly into Oath of Druids.